The SDP800 series of differential pressure sensors provide a reliable solution for precise measurements of air flow in challenging but cost-sensitive HVAC applications, like filter monitoring, VAV controllers, heat recovery systems, and burners. Based on the state-of-the-art CMOSens® sensor chip, the SDP800 differential pressure sensors thus utilize the successful features of the SDP600 series. They are the result of over 15 years of experience in measuring air flow in innumerable numbers of patients, HVAC systems, and car engines. Thanks to their proven form factor, the differential pressure sensors of the SDP800 series can be effortlessly integrated. The next-generation sensor chip provides smart averaging functions, extended functionality, and multiple measurement modes. Similar to all Sensirion differential pressure sensors, those from the SDP800 series are defined by their long-term stability and excellent accuracy, along with no zero-point drift. The highly versatile digital version includes adaptable measurement speeds of around 2 kHz, smart averaging functions, and multiple measurement modes (triggered/continuous mode). The version that has analog ratiometric voltage output can be configured to either linear or square root through a separate pin. The SDP81x is intended for a tube connection, while the SDP80x is designed for a direct threaded connection to a pressure manifold through O-ring sealing. The SDP800 series, similar to all of Sensirion’s differential pressure sensors, is based on the patented CMOSens® Technology of Sensirion. 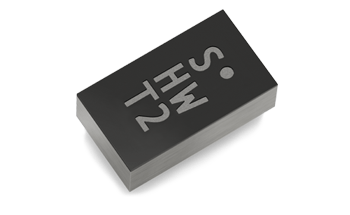 This technology integrates the sensor element, digital calibration, and signal processing on a compact CMOS chip. Furthermore, the differential pressure is determined by a thermal sensor element using the flow-through principle. Due to this, the CMOSens® differential pressure sensors from Sensirion outpace conventional piezo-resistive membrane sensors in terms of sensitivity at low differential pressures and offset hysteresis and drift as well as temperature variations, position sensitivity, and shock resistance. The EK-P5 evaluation kit provides fast, easy, and cost-efficient testing and evaluation of the SDP800 series differential pressure sensors. The kit includes a SDP810 sensor that can be easily plugged into a PC through a USB cable. Using the software available online for download, users can test the differential pressure sensor under realistic conditions by following the easy installation steps. The kit can be directly purchased from Sensirion distributors. 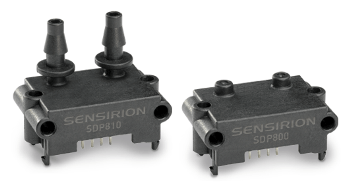 Sensirion provides caps as an add-on component for the SDP800 series differential pressure sensors. The caps are particularly designed for applications where the sensor is connected with a cable and not PCB-mounted. Here, the caps act as a connector and allow a secure and easy connection between the sensor and the cable. They are compatible with all SDP800 sensors as well as the DuraClik™ Wire-to-Board Receptacle Housing. The measurement of gas flow in applications demanding cost-efficiency and high precision is a major challenge. In recent years, experience has demonstrated that microthermal flow sensors are better than other technologies. Industries with stringent requirements, like medical and automotive technology, have come to recognize that microthermal gas flow sensors give decisive advantages to their products. These manifest themselves in high precision and long-term stability even when flow rates are minimal, and the suitability of sensors for reliable and cost-efficient mass production.